The hydrogen economy is not going to save us from rising energy costs! Those who have followed my writings know I have been a naysayer regarding the idea of using privately owned EVs as a means of powering the grid at peak demand times since I first saw the idea floated in the very early 2000s. I'm not going to re-iterate the myriad reasons why "vehicle to grid" (V2G) has been a doomed concept from the start. What I do want to point out is that Elon Musk decidedly nailed that coffin shut on April 30th, with 2 big nails. The first nail is the household scale PowerWall, which can be scaled from 7 to 90 kWh of local electricity storage, tailored to the customers needs. In areas with interval (time of use) pricing, peak demand constraints can now be erased with a simple price signal from the local utility to their customers. Make it cost-effective for customers to charge with cheap electricity (e.g., nights and weekends) and use their household battery to power their house at peak demand times, and the customers will buy, install and run all the distributed storage the local utility could ever want. No need to feed power back to the grid because the peak demand perceived by the utility will simply disappear, replaced by customers drawing from their battery instead of the grid to avoid high-priced electricity. No need for the vehicle to be involved (which was always a ridiculously expensive way to package a grid or building power support battery anyway). The second nail is the utility scale battery based on the same technology, which can be scaled from 100 kWh to effectively infinite. Instead of relying on customers' vehicle batteries or household batteries, the utility can now just park a big battery bank near high demand areas (e.g., substation level or beside big demand customers). Charge up at low demand periods, power customers at high demand periods, increase grid reliability and reduce transmission infrastructure costs by levelling out demand on the transmission wires. These batteries will always be available (not stuck in traffic) to the utility for its needs, and less expensive than new construction of several conventional peak generation technologies now (coal, natural gas peaker plants) for meeting peak demand loads. Now, perhaps we can get back to conversations about intelligent EV charging, and how that can be a huge benefit to local electrical utilities. This episode (Switching to an electric car isn't always good for the environment) was disappointing in the number of misleading assertions, dropped threads and incorrect statements. I am not taking issue with Professor Kennedy’s statements or study. The focus of discussion became the jurisdictions which burn coal to generate electricity, but this is not where the majority of Canadians live. Only 15% of Canadians live in provinces where the carbon intensity of electrical generation in 2006 was above Professor Kennedy’s threshold of 600 t CO2e/GWh). In eight out of ten provinces, electric vehicles are better than fossil-fuelled vehicles based on the dirtier grid of 2006 in terms of CO2 emissions reduction. Our 3 most populous provinces (Ontario, Quebec and BC) have 75% of our national population, and pretty clean electricity. Switching those fleets to electric vehicles would pretty much allow Canada to reach its 2020 carbon reduction targets, while taking no other action on climate change in the country. Therefore, we only need to switch 75% of the fleet in 3 provinces to electric drive to fulfill the emissions reduction target. The reduction in demand for fossil fuels will likely ensure that sector does not increase its emissions, helping ensure we meet the target. We better get moving - only 5 years left to make the switch. If the federal government actually had their eye on the prize, they would be co-funding the EV incentives in the 3 most populated provinces in order to support the Alberta oil industry so it can continue production while the country meets its Copenhagen commitment. Oh, and we should be cleaning up the grid in the rest of country anyway for economic, health and environmental reasons. 2015-03-25 Update: Link to episode: "Switching to an electric car isn't always good for the environment"
To close out 2014, commentary on something which hit my in-box. 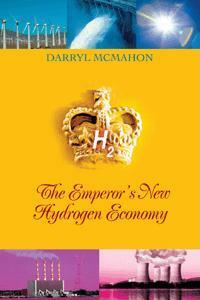 Normally, I don't bother with hydrogen hype anymore (been there, done that, wrote the book). "fueled simply by hydrogen present in air"
Well, I know this is preposterous on the face of it because there is virtually no free hydrogen in the air in Earth's atmosphere. Wikipedia says "By volume, dry air contains 78.09% nitrogen, 20.95% oxygen, 0.93% argon, 0.039% carbon dioxide, and small amounts of other gases. " Oops, hydrogen did not make the list. Incidentally, the next few elements on the list would be: neon (0.001818%), helium (0.000524% and methane (0.000179%). Still no hydrogen. Hydrogen occurs in the atmosphere at roughly 500 parts per billion (0.00005%). About 1/10th as common as helium. There are a couple of good reasons hydrogen is rare in the atmosphere. 1) Hydrogen is hyper- reactive. It wants to bond with oxygen to become water (vapour). 2) Hydrogen is the lightest (least dense) element in the universe, so it floats up out of the atmosphere unless it reacts with something else on the way. In either case, it's not going to hang around in the air close to the surface as H2 gas. "When you know how it should work, it is a very simple setup. You put a hydrogen-containing gas on one side, apply small electric current and collect pure hydrogen on the other side. This hydrogen can then be burned in a fuel cell." Seriously?! Their secret is electrolysis? Seems a lot easier to electrolyse water than try to gather up some rare gases from the atmosphere. I mean, the water just sits there, waiting for you. Seems pretty plentiful, too, something about covering about 3/4's of the planet's surface. But for giggles, let's consider which gases in the atmosphere might be candidates. The common gases are simple elements (nitrogen, oxygen and argon, so no hydrogen to be had there. Next, carbon dioxide - no hydrogen there. Neon and helium don't help. By now, we should have reached water vapour, but really, isn't liquid water a lot easier to access? So next would be methane (CH4). Got some hydrogen there, but it's just 0.000179% of the atmosphere. So there's going to be a lot of seiving done to separate the atmospheric CH4 from the air, which will take equipment and energy. Probably more than can be produced from burning the captured hydrogen. So, once again, if you read past the misleading hydrogen headline, all you find is more hydrogen vapour mirage. Tripped over this in digging for facts for the above, which might also be of interest. Since I last wrote here, the industrialized and industrializing world has lurched back toward global recession. As a result, the world-wide demand for oil is dropping slowly. That's a good thing for the survival of our species (we might put off catastrophic climate change effects for a couple of weeks as a result.) It's seen as bad news by those dependent on the oil economy (e.g., Alberta as a whole). This has led to lower gasoline prices, and because Canadian consumers typically don't do financial planning beyond their next car payment, they are back to buying pick-up trucks and SUVs in record numbers. It's as if people don't think the oil price will go back up. Well, the easy oil is gone. It's harder and more expensive to get the next barrel. Right now, industry analysts say bitumen extraction is generally a money-loser (at around US$70 per barrel and lower, while the break-even price is estimated as between US$75 and US$85 a barrel.) So, oil workers in Alberta and Saskatchewan are being laid off until prices recover. However, if you are not an oil worker, consider this. If dealers are selling a lot of trucks, they probably are not selling as many EVs and plug-in hybrids. So, if you want to save money on gasoline for years instead of for a few weeks or possibly months, this could be a really good time to negotiate with a local dealer on an EV or plug-in hybrid sitting on their lot. When oil prices start back up, they won't be so anxious to offer big discounts on cars that don't need oil for fuel. My wife leased our 2012 Nissan Leaf electric car in May of 2013. This month, it paid for our EVacation. We did not take the Leaf on this trip, so let me explain how our electric car helped us make this trip to California, spend 3 days in San Francisco (during the World Series excitement) and take a 7-day cruise down the Pacific coast. After 16 months of not paying for gasoline or ICE 'regular' maintenance, we had accumulated enough money (with some research and careful comparison shopping) to pay for roundtrip airline tickets for 2, a stateroom on a nice cruiseliner for a week, and some cash for shopping and incidental expenses. That's how our electric car paid for our vacation on the other side of the continent, while the Leaf stayed home. However, that was not the end of our EV connections for this trip. As time permits, I will download some photos and write a bit about what we saw related to EVs in San Francisco, Long Beach and San Diego, California. EVs: save money, save the world. My children have never known a time there was not an electric car in our driveway. This week, I needed to drive to the cottage to attend to a maintenance issue. The weather was very nice, so I was driving with the windows down and generally enjoying the experience. On the way up into the Gatineaus, I was driving through the Hull sector on a 4-lane, divided roadway, and came up to a red light. As I pulled our Nissan Leaf up behind the stopped vehicle ahead of me, I recognized it as a Chevy Volt. Two cars pulled up and stopped in the lane beside us; a Prius C and a conventional Prius 2nd generation. This was not at an EV event, just an unexpected moment in regular, daily, city traffic. It was almost unsettling, when one is so accustomed to internal combustion engine traffic noise. More unsettling though, was the clapped out Acura in need of a new exhaust system which shattered the moment. Unpleasant. EV Moments. Still rare and fragile, but becoming more common. So close to getting it right, but at least it is progress. Of course, it would also help if the provincial government would make a clear call on definitions to clean up the mess they made originally that spawned the 'pedelecs'. We should be encouraging electric-assist bicycles on Ontario roads, because they are energy-efficient and can help ease traffic congestion (read lower taxes for road expansion and shorter commute times). Oh, they also happen to increase exercise, reduce air, water, ground, noise and thermal pollution, and reduce greenhouse gas emissions relative to the car they usually replace for these particular trips. The catch is, they are an additional cost for the owner, and the rules regarding their use are confusing - both inconsistent by jurisdiction and subject to change, putting private investments at risk. The federal and provincial laws regarding the e-bikes are pretty simple. Regardless of their outward appearance, if the machine meets the definition of 'power-assisted bicycle' (PAB, or generally referred to as e-bikes), then it should be treated like a regular, human powered bicycle. It also has to be able to be moved via human power. This is the clear intent of the enabling federal rules from circa 2000. The point of the 32 km/h limit is to keep top speed in the same range as traditional human-powered bicycles. Note that recumbent bicycles can routinely exceed 32 km/h with only moderate exertion. Then we have to get rid of (Ontario) rules that treat e-bikes differently from muscle-powered bikes, such as restricting ridership to those 16 years of age and older, and requiring use of a helmet by adults on e-bikes, which is not required on muscle-powered bikes. Stop making it confusing. Then, we need to get municipalities and other bodies that maintain roadways, bicycle lanes, multi-use pathways, bike paths, etc. to also adopt a consistent approach on e-bikes, and which is enforceable. Stop making it confusing. Let's deal with the perception and disinformation issues and get past them. If your issue is that some e-bikes have some fancy plastic body panels and look attractive, either get over it or get the rules changed so there is a different vehicle category based on appearance. Because some of the step-thru body e-bikes can be lighter than 'safety'-bike style e-bikes. If your issue is speed, then enforce the speed limits for the roadways and paths, and not via the vehicle's performance. (We don't ban Ferraris from municipal roads because they can travel faster than 50 km/h.) If your issue is bad behaviour by e-bike riders, then bring out some enforcement, and go after all the scofflaws, including pedestrians, pets, roller-bladers, skateboarders and muscle-bikers. If your issue is vehicle weight, then define your acceptable limit bring out the portable scales to weigh vehicles with riders and cargo - including trailers. However, you plan to do this, make the rules consistent between muscle-bikes and e-bikes, and across jurisdictions. Stop making it confusing. As for the e-bike users, you need to understand and abide by the rules, or face the consequences. If you take the pedals off (even if you put them in the storage compartment), you no longer have an e-bike, you have a low-speed electric motorcycle. Get it licensed, get a DOT approved motorcycle helmet and wear it, and pay the insurance. If you are riding on a path with a posted speed limit, stay under it. Make sure your safety equipment and instrumentation is present and fully operational. Stay off the sidewalks and observe the traffic laws. Set the standard for good vehicle operation behaviour. Darryl McMahon built his first electric car in 1978, and has had at least one electric vehicle EVer since. He was a founding member of the Electric Vehicle Association of Canada. He is the author of The Emperor's New Hydrogen Economy and many articles about electric vehicles, related technology and history. He is currently a member of the Electric Vehicle Council of Ottawa, Electric Mobility Canada, Historian for the Electric Auto Association, and President of Econogics.